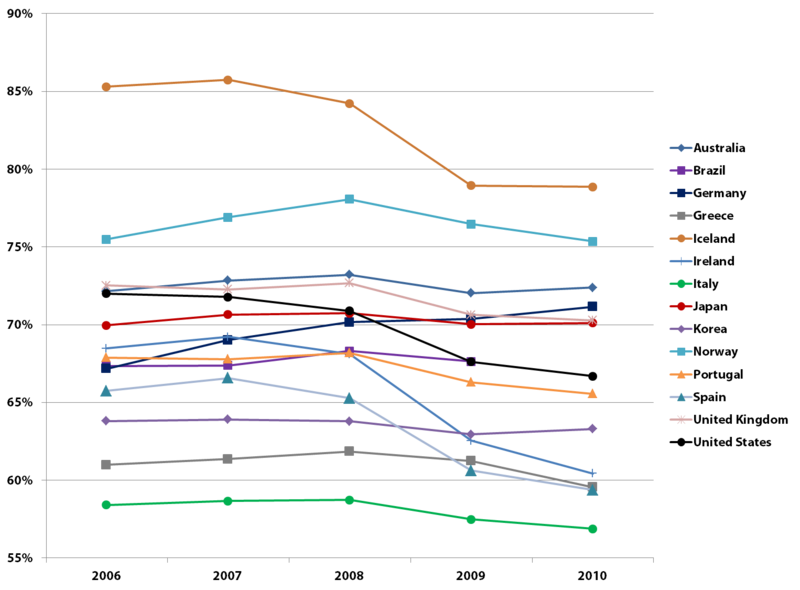 Previously (on August 9, 2011), I compared unemployment rates of 15 countries. I think I made a naive comparison. While unemployment rates are calculated by each country using their own methodologies, employment rates give little confusion by being estimated with obvious numbers. The employment rate measures the ratio of employed people in certain age groups. The unemployment comparison graph in the previous post gave me (us) a misguiding impression that certain countries' economies have been well performing while their actual employment rates were not so good, and vice versa. 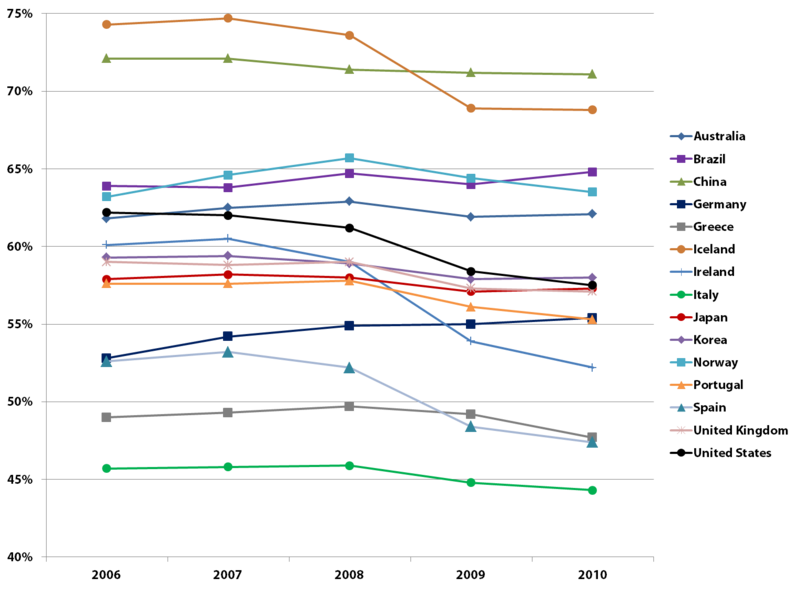 Today, I am trying to compare "employment rates" of the same 15 countries from 2006 to 2010. I want to share two figures of employment rates calculated with different methods. In this figure, we can see how the employment rate estimation tells us a different story from the unemployment rate statistics. High unemployment rates do NOT mean low employment rates. Contrary to an intuitive conception, some countries with low unemployment rates are NOT always showing high employment rates, either. In the previous post, Iceland's unemployment rate skyrocketed since 2008. However, as we can see from the above figure, its employment rates are still higher than all countries. Although Korea's unemployment rates were low in the previous post, they don't translate into high employment rates in the above figure. Italy's lowest employment rates among these countries are hard to explain, too. In the previous post, its unemployment rates were not worse than those of such countries as Spain, Ireland, and Greece. The second figure estimates the ratio of the employed people among the population aged 15 or older, without an upper age limit. It is estimated by the International Labour Organization (ILO). In this second figure, most countries have shown downward slopes in employment rates since the global financial crisis shook the global economy in 2008. It is not so much different from the first figure. However, I want to point out some interesting observations. Now, China is enjoying the best employment rates. 71% of its working-age population is employed. Although Iceland has experienced a deep drop of employment rates, it still shows a robust employment rate. The fact that employment rates in Brazil and Germany didn't get worse during 2008-2010 is consistent with the descending unemployment rates observed in the previous post. A notable contrast is between the United States and South Korea. In the first figure, the United States' employment rate was well above South Korea's even after the economic recession. In the second figure, however, the United States' employment rate went down below that of South Korea in 2010. From the ILO's standards, the United States' employment condition became worse than that of South Korea. I'm not so sure whether these employment rate estimations are better or more correct than the unemployment rate estimations. But we have to look into employment rates if we don't want to be confused by different unemployment rate calculation methods among countries.